Super Talent introduced the USB 3.0 Express Duo 2-CH flash drives, claiming that these units offer USB 3.0 performance at a USB 2.0 price. You can get them in 8GB, 16GB and 32GB capacities, but pricing is still unknown. 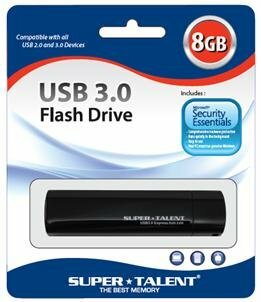 Super Talent Technology, a leading manufacturer of Flash storage solutions and DRAM memory modules, today announced a new USB 3.0 flash drive, the USB 3.0 Express DUO 2-CH. The 2-channel design of the Express Duo 2-CH can top over 67MB/s when plugged into a USB 3.0 port, yet remains fully-backward compatible to USB 2.0â€¦ and for about the same price. "Here's a USB 3.0 drive that performs, yet stays on budget. There's simply really no reason to buy a USB 2.0 flash drive anymore" CH Lee COO of SuperTalent.